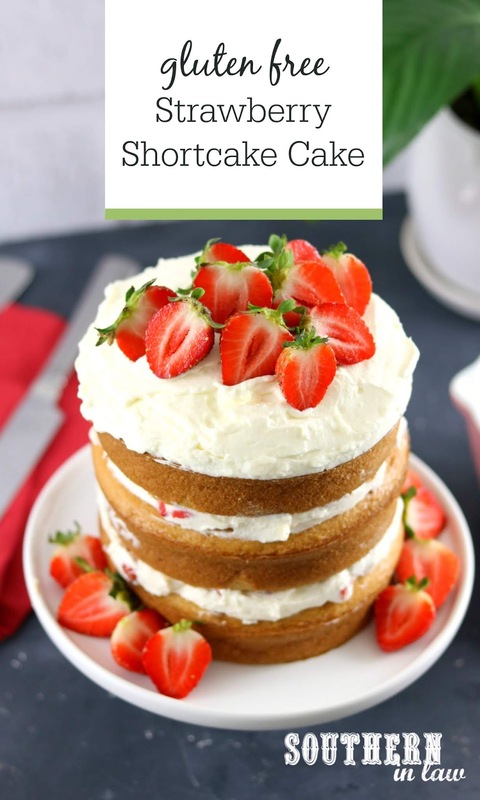 This Gluten Free Strawberry Shortcake Cake Recipe will become a new family favorite! 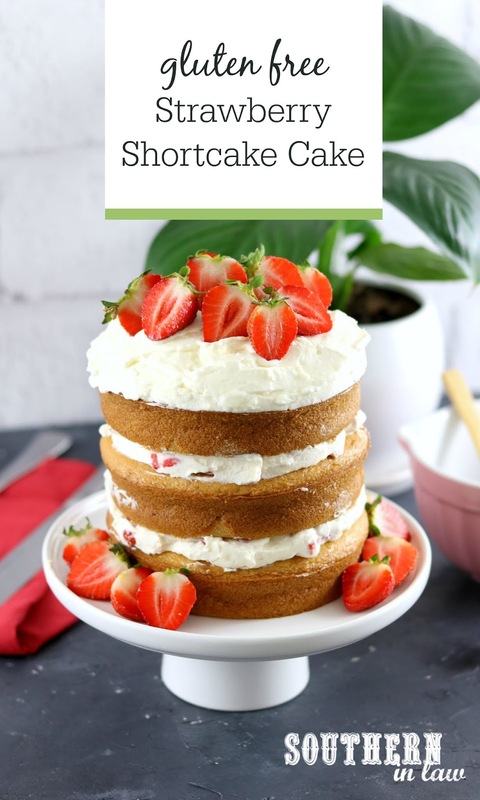 Perfect as a birthday cake or for sharing with friends, this soft and fluffy gluten free vanilla cake is topped with whipped cream frosting and fresh strawberries for an easy but impressive dessert. Can be made into a sheet cake, layer cake or a single cake. Today is Jesse's birthday - but I am totally bummed because we don't actually get to spend it together! You think we'd be used to celebrating birthdays apart after doing it for 5 years... but we're now used to being together, so whenever he's working interstate it totally stinks. But because it's not a birthday without cake, we celebrated his birthday a little bit early with plenty of cake - and we're planning on celebrating him again this weekend with lots more cake and a barbecue with friends - so it's not all bad! This cake totally makes up for it. A few months ago, when I asked Jesse what he wanted for his birthday cake this year, he mentioned that he wanted a Strawberry Shortcake Cake - so I set to work creating the ultimate strawberry shortcake cake - that was also gluten free, because he didn't want me to miss out! Creating a soft and fluffy gluten free cake can be a bit of a challenge - but eventually I managed to perfect it and came up with the recipe I'm sharing today. My #protip? Buy these cake strips. If you find your cake edges are often too crispy, or your cakes puff up too much in the middle/bake unevenly, these cake strips are a lifesaver. They are seriously my new favourite thing. Oh and #protip number two is probably don't make a three layer cake, unless you want all the mess that comes with it 😜 It looks impressive, but cutting into it is seriously messy! 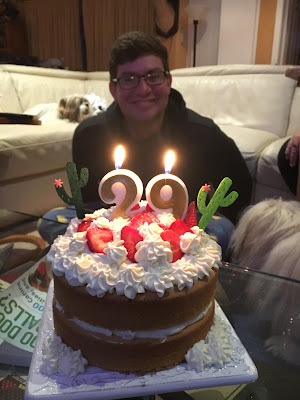 Here is what Jesse's early birthday cake looked like (obviously not the photographed recipe version). It's the same cake recipe - only I put the frosting into a piping bag and piped it on top instead of simply spreading it - and did two layers instead of three. Much neater and so much easier to slice. Grease your cake pans and set aside. In a mixer, cream your butter and sugar until light and fluffy. While you're beating your butter and sugar, and your milk and lemon juice to a bowl and allow to sit for a few minutes, or until the milk begins to curdle. (Alternatively, if you have buttermilk, you can use 1 1/3 cup buttermilk). Add your egg whites, egg and vanilla to your milk and stir to combine. Once your butter is light and fluffy, scrape down the sides and add 1/3 of your flour mix and 1/3 of your milk mix. Stir your mix on a low speed until your ingredients are just incorporated, and then add another 1/3 of your flour and milk mixes, stirring and repeating the process with the final 1/3. Once all of your mix is in the bowl and mixed together, scrape down the sides and mix your batter on a high speed for 2 minutes. Scoop your batter into your prepared cake tins, ensuring that if you're making a layer cake, you divide the mixture evenly. Smooth the top of your cake mixture to ensure the mixture is evenly spread and bake your cakes for 20-30 minutes, or until a skewer inserted into the centre removes clean. Cooking time will vary depending on the thickness of your cakes, so keep an eye on them and take them out as soon as they're cooked through. Allow to cool in the pans for 5-10 minutes before turning your cakes out onto a wire rack. Place your cream and icing sugar into the bowl of your mixer with a whisk attachment added. Whisk your cream and icing sugar on high speed until soft peaks form. Place your cold water into a microwave safe bowl and sprinkle over your gelatin powder, leaving to sit for 10-20 seconds so the water begins to absorb. Place your bowl into the microwave and microwave for 10 seconds. Stir with a spoon to ensure no lumps remain. Turn your mixer onto a low speed and slowly add in your gelatin. Scrape down the sides to ensure everything is incorporated and turn your mixture back up to high, whipping your cream until you get stiff peaks (meaning the cream will be firm and if you pick some up on a spoon of your beater it will hold shape). Frost your cooled cakes as desired and enjoy! 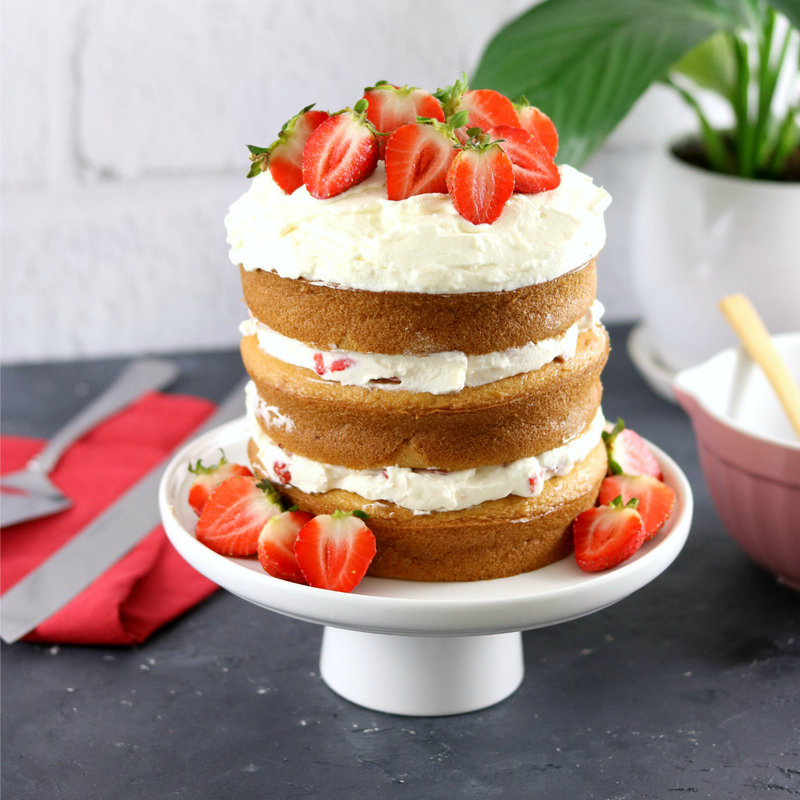 To frost our cakes, I added some chopped strawberries to half of the cream to use in the filling and then frosting the top of the cake with the remaining frosting, decorating the cake with sliced strawberries. *Note: Use a mix with Xantham Gum added for the best results. 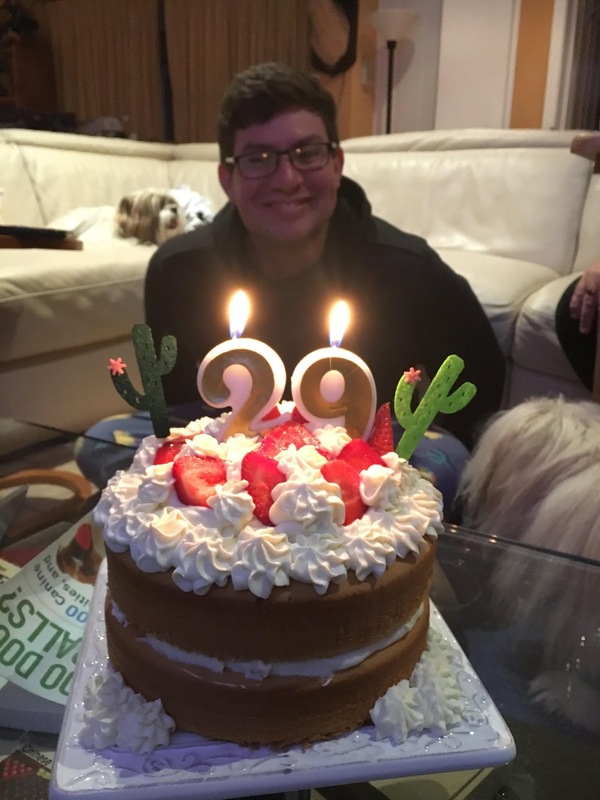 Do you have the same birthday cake every year? Or do you like to have something different every year?